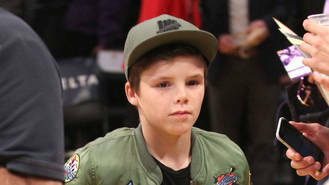 The 11-year-old son of fashion designer Victoria Beckham and her professional soccer player husband David Beckham has signed with Scooter Braun, who discovered Canadian star Justin in 2007. A new Instagram account for Cruz unveiled on Monday (05Dec16) states the page is managed by Scooter Braun Productions, indicating that the youngest of the Beckham boys has been snapped up by the music mogul. The account also contains videos of Cruz singing to camera, and an image with the caption: "Welcome to my new page. Something exciting to share with you all this week!" Cruz also included two quick Instagram covers of Anna Kendrick's Cups from Pitch Perfect and Hopeful by Twista and Faith Evans, both of which he hit headlines for earlier this year (16). Cruz's older brother Brooklyn, 17, posted a link to the new social media page, writing: "Everyone welcome @cruzbeckham to Instagram. Something exciting to announce this week!" Cruz’s mum Victoria, who was herself a chart-topping singer both as a solo artist and a former Spice Girl, has previously posted photos of her son playing the guitar, which he reportedly took up earlier this year (16), after Scooter showed an interest in signing him. And if his Instagram following is anything to go by, the youngster is already set for success. Cruz has racked up 92,000 followers within the first 24 hours of him launching his social media page. Meanwhile, Cruz's famous parents have been vocal on social media platforms, but for a very different reason. David has teamed up with UNICEF to create a short film to show how violence can affect children, with the video showing children appearing as animated tattoos on his body. "Violence can mark children forever. I’ve met children with @unicef who have been affected by terrible violence and abuse and seen the long-lasting scars it can leave. I chose the marks on my body but millions of children bear marks they have not chosen," he wrote on Instagram, alongside the new campaign. "Please share this film to help #ENDviolence #foreverychild. It’s wrong. End it. #7fund."